The Annual Free Throw Contest, sponsored by the Remsen Knights of Columbus, was held at St. Mary’s High School, on Sunday, January 14. Thirty eight participants, ages 9-14, shot 15 free throws. Medals were awarded for first, second, and third most shots in each age group for boys’ and for girls’ divisions. The first place finishers move on to compete in the next round, which will be held in Cherokee on February 4. First place finishers at the KC Free Throw Contest included (ages group in parenthesis), Front row, from left: Tia Tentinger (9), Eli Harpenau (9), Grace Galles (10), Parker Loutsch (10), Kylie Harpenau (11), Austin Klein (11), and Gracyn Schroeder (13). Back row, from left: Mya Bunkers (12), Mitchell Schnepf (12), Cael Ortmann (13), Taylor Harpenau (14), and Carter Schorg (14). These twelve children move on to compete in the next round at Cherokee on February 4. 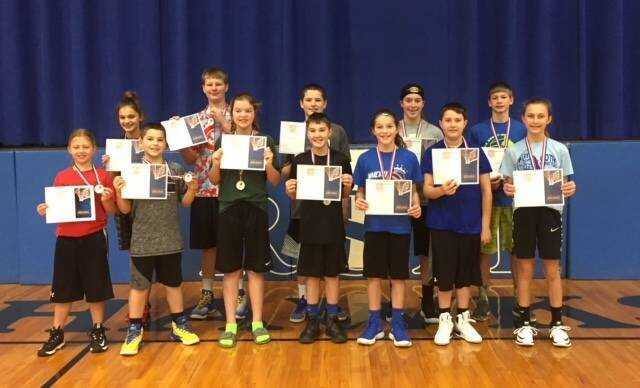 First, second, and third place finishers at the KC Free Throw Contest, which was held on January 14, picture above include (age group and place in parenthesis), Front row, from left: Tapkia Nothem (9-2nd), Gracie Schroeder (9-3rd), Tia Tentinger (9-1st), Taylor Harpenau (14-1st), Jacie Homan (12-3rd), Halle Galles (12-2nd), Kylie Harpenau (11-1st), Callie Arens (11-2nd), Grace Galles (10-1st), Josie Schwickerath (10-2nd), Micah Loutsch (9-2nd), Madelyn Kelley (10-3rd), Mya Bunkers (12-1st), and Gracyn Schroeder (13-1st). Back row, from left: Austin Schwickerath (14-3rd), Carter Schorg (14-1st), Alex Schroeder (13-3rd), Kadden Groepper (14-2nd), Cael Ortmann (13-1st), Jaxon Bunkers (13-2nd), Owen Schroeder (12-2nd), Mitchell Schnepf (12-1st), Cole Homan (12-3rd), Austin Klein (11-1st), Brady Koenck (11-2nd), Landon Waldschmitt (11-3rd), Collin Homan (10-3rd), Elijah Schroeder (10-2nd), Parker Loutsch (10-1st), and Eli Harpenau (9-1st).